Dolls, to the left you will find Casadei’s ultra-stylish 6122 Strappy Platform Sandals – the very same ones seen on Carolina from Fashionsquad; now, if you’ll take a glance to the right, you will find Jessica Simpson’s pretty Pai. While the Simpson stunners sport a slightly higher heel and platform than that of their Casadei counterparts; for a mere $98.00, in comparison to the $850.00 approximate retail value of the Casadei charmers, they are every bit as capable of contributing a statuesque touch to your look du jour - at a price that allows the budget babe to indulge in all three saucy shades (Estate Blue Maya Nubuck, Cloud Grey Maya Nubuck, and Black Maya Nubuck)! 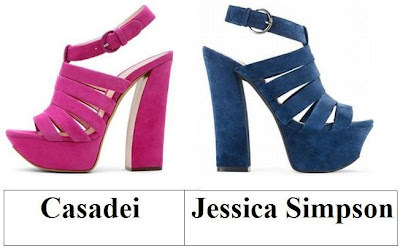 Tell me, kittens…will you be a big spender and go for Casadei, or be thrifty and spring for Jessica Simpson? Thanks to Zappos for the picture. I'm not sure I could deal with shoes that high! I so love the pink!!! Really cool shoes. I like the lower price, for sure. So love the style. I'd go for the cheaper ones! Definately going to be thrifty with this one! less and expensive and a higher heel, who wouldnt?? So lov'n this shoe. I like that cheaper price too! Awesome colors! I'd go for the cheaper one! Beautiful but some times, like this time, I can make the trade for the JS with no worries .... I love her shoes now, when she 1st came up with the brand I didn't really like them but now I love them and the color is amazing very pretty. oh wow, this is a total rip. looks like the JS has a higher heel but they are so similar that it's hard not to like both. Jessica's all the way! Love em. Jessica Simpson's shoes are fab. I would definitely spring for them. Great find! I even like the Jessica Simpson ones more. i honestly can't even see a difference, minus the color lol! Just this morning I was drooling over some jewel toned suede heels! But JS might just have won me over on this one! For some reason, I tend to be very hard on suede and nubuck shoes, so I really can't afford to ruin a pair of $850 shoes! They're both so pretty! I would buy both, hehe. I prefer the blue one though. Oh wow... that is a huuuge price difference for such little difference! I'd kind of like to wear both at the same time. But I should probably just stick with Jessica Simpson's shoes. Way more affordable. Those are cute! I actually like the blue a little better. Love both but would never be able to walk in either! its so cool how you find this stuff! so useful too. haha youre good at that!! i would go for the cheaper ones for sure. Jessica's also look a bit more comfortable which is very import in a shoe. Plus the price, that's the choice! I love the blue color of the Jessica Simpsons! They look completely the same! Where do you find these amazing stuff!? btw. would you like to follow each other? These are some fierce shoes! I'd definitely give the Jessica Simpson pair a shot! What fun colors in both shoes!! You know me...I would go for the cheaper pair!! Can I have both if I ask real nice??? Lovely picks. I must say....my vote might be with Ms. Simpson this time. Cannot resist the savings!! Incredible! And what a price difference! ooo, these heels rock! and omg at that price difference! i would just stick to the $98 jess simpson!